Zeatech's Food & Beverage (F&B) POS with Touch screen technology has fully functional options with din-in, take-away and catering facility. Our order taking, order tracking and billing expedite the customer order. By sending the orders to multiple kitchen printers, it makes your business more systematic and time saving. It is easy to monitor table occupation and timely service. Bill sharing and table sharing options will make the transaction fast. You can avoid delivery of wrong item to wrong customer and charging wrong price. It will caution the item not been served and also the table not been served. It allows you to make individual and group discount. Mishandling of cash can be avoided. At the end of the day, business transactions of each operating outlet will send to the head quarters for sales record keeping. Real time sales analysis on items sold. Graphical presentation for the each and every item sold. You can plan your staff based on the item sold on particular time period. With our stock control module you can do recipe costing, so that you can easily identify the product which makes profit/loss. Our comprehensive inventory control and replenishment functions help you to keep your ready made items inventory always available. Our systems integrate retail sales, accounts receivable, accounts payable, member billing, purchase order, inventory control with general ledger. Our Touch screen technology designed for fast and quick transactions and allows user to adapt the system quickly. A simple, intuitive user interface that is easy to learn and enables quick transaction processing with minimum keystrokes and automated credit/debit card processing capabilities allows cashiers to process more customers in less time. 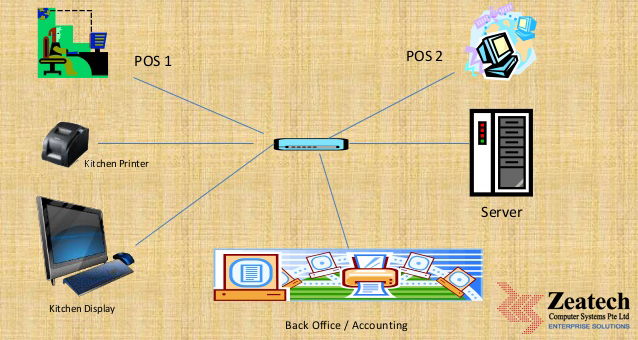 Zeatech Touch screen F&B POS will help you to give maximum comfort and satisfaction to your customers. Small opportunities are often the beginning of great enterprise.